Led by millennials, some 88 million Americans plan to take family vacations this year. According to the latest research from AAA Travel, 44 percent of millennials nationwide are planning a family getaway, more than members of Generation X (39 percent) or baby boomers (32 percent). As travelers seek new sights, AAA expects family trips abroad to be a hot trend in 2018. Of families who will take a trip this year, 35 percent plan to visit an international destination – a nine percentage point increase from just two years ago. “We’ve seen that popular destinations for millennials from our area range from exotic locales such as the beaches of Punta Cana and backpacking trips through Europe, to American favorites like Universal Orlando,” continued Powell. Families are taking more trips per year. One in four (27 percent) traveling families are planning to take three or more family vacations in the next 12 months, 12 percentage points more than in 2016. When booking trips, AAA’s travel experts recommend keeping AAA’s Diamonds in mind. AAA’s professional inspectors assess nearly 59,000 hotels and restaurants across the United States, Canada, Mexico and the Caribbean to assign AAA Diamond Ratings. Every AAA Inspected & Approved hotel and restaurant is acceptable for the type of experience it provides. Ratings, from One to Five Diamonds, help travelers find the level of services, facilities and amenities they’re looking for on their vacation. Travelers can find Diamond Rated establishments in the AAA Travel Guides and TripTik Travel Planner. 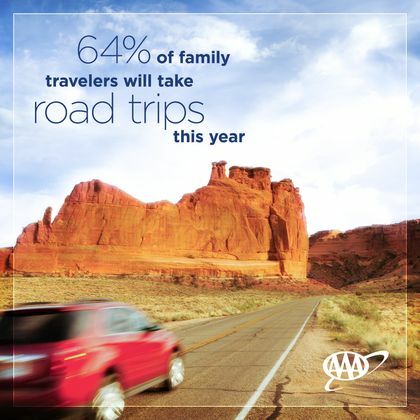 About the study: AAA’s family travel research is the result of a telephone survey (landline and cell phone) consisting of 1,005 adults living in the continental United States. Interviewing for this survey was conducted January 26-28, 2018. This study has an average statistical error of ±7 percent at the 95 percent confidence level for all U.S. adults.